Today, we are excited to bring back Profiles in Service. Throughout the summer, we’ll be connecting you with the organizations and individuals making a positive impact in the Athens community. Last week our Summer Fellows visited Casa de Amistad, a local organization that works to address the needs of the Athens-Clarke County Hispanic and greater immigrant population. A product of grassroots activism, the origins of Casa de Amistad emerged in 2000 as the former Garden Springs mobile home park, composed predominately of Hispanic residents, was being sold for student housing re-development. While most of the park’s residents were forced to move, by 2003 the movement had laid the groundwork for what would become Casa de Amistad. Now serving over 500 individuals in the Athens area, the organization provides a number of outreach programs including adult English language and computer literacy classes, tutoring sessions for kids and music and art lessons. In addition, the organization also boasts an ever growing community garden of fresh produce and distributes food packages regularly to help alleviate the hunger needs of its clients, nearly 100% of who fall below the poverty line. Alex Borges, the current Executive Director, originally moved to Athens in 2009 to begin working with the Clarke County School District’s Migrant Education Program but soon found the opportunity of a “blank slate” in which to address community needs directly too appealing to pass up. Entering his third year as Executive Director, Borges has helped elevate the organization’s outreach initiatives and fostered partnerships with other organizations in Athens such as Project Safe and the Ark. In the future, he hopes to establish a GED class so that more people served by Casa de Amistad have a chance to pursue an education and quality jobs in the community. 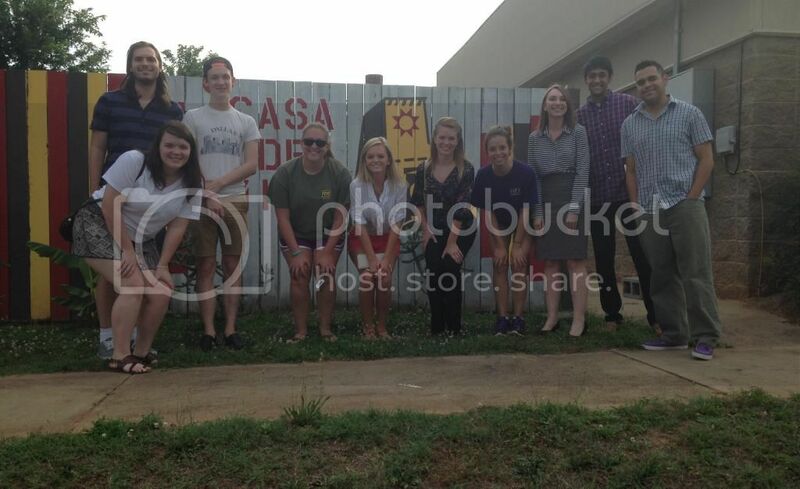 Our team of summer fellows who visited Casa de Amistad last week. Casa de Amistad relies heavily on the hard work and dedication of its volunteers. To find out more how you can help, check out Casa on Facebook or visit http://www.athensamistad.org/ for more information.